This is a good article by Dr. Oz…. I think of the body’s hormones as musical instruments in an orchestra: Each plays its own part in creating a perfect concert–until the day one is out of tune and throws off the entire melody. Although it was many years ago, I still remember one of the first patients I saw with a hormonal disturbance. She was a lovely woman in her early 40s who was a little heavy; despite having tried every diet under the sun, she couldn’t seem to shed the extra pounds. As we talked and she mentioned a few more of her concerns–dry skin, brittle hair, a lack of energy (even shortly after her morning coffee)–I realized I needed to test her thyroid levels. Sure enough, they were too low. With proper medication, my patient’s skin and energy improved, and she was no longer a prisoner to a simple chemical imbalance. No one should have to live with an untreated hormone problem. Some require medical care, while others may be addressed with lifestyle adjustments, but almost all are treatable. Here is a guide to some of the most common signs of hormone imbalance–and what you can do to restore harmony. If you’re concerned about low libido, try incorporating more zinc-rich foods–like oysters and sesame seeds–into your diet (zinc appears to be linked to an increase in testosterone levels), and ask your doctor about testosterone supplementation. To treat PCOS, your doctor might recommend taking birth control pills containing synthetic hormones that reduce the production of testosterone. It’s also important to avoid refined sugars and other carbohydrates in your diet (insulin resistance is linked to a boost in testosterone production) and to eat more fiber (which counteracts blood sugar spikes and promotes the excretion of excess sugars from the body). 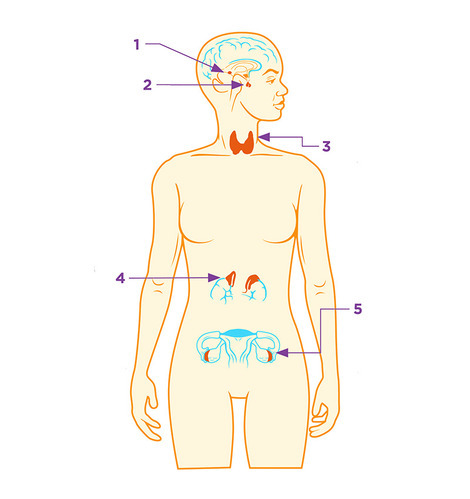 Thyroid hormone regulates how fast you burn calories. One in ten women doesn’t produce enough of it–a condition known as hypothyroidism, which can lead to weight gain, depression, and fatigue. On the other end of the spectrum is hyperthyroidism, in which the thyroid gland releases too much of its hormone, causing symptoms such as anxiety, a racing heart, excessive sweating, even diarrhea. If you have hypothyroidism, a daily thyroid hormone replacement pill can help correct the imbalance. You might also want to consider eating more onion. This veggie contains kaempferol, a compound that may kick-start production of the hormone. If you have an overactive thyroid, your doctor may prescribe one of several treatments, from radioactive iodine–to slow hormone production–to surgical removal of the gland; most patients respond well once they get the proper care. Aldosterone regulates your body’s sodium-to-water ratio. But a condition called renal artery stenosis–a narrowing of the blood vessels that supply the kidneys–can trigger the release of the hormone, causing a surge in blood pressure. When you’re under pressure, your cortisol spikes to provide the body with a quick dose of energy. Chronic stress, however, can keep your cortisol elevated continuously–a dangerous state, since the hormone can suppress the immune system and has been linked to the accumulation of abdominal fat. These organs produce more than eggs; they manufacture and release the most important hormones for female development: estrogen, progesterone, and–yes–testosterone.